I'm not a make-up kinda gal. I wear eye shadow and mascara regularly, and I throw on some eyeliner for really special occasions. Other than that, I take the all natural route. 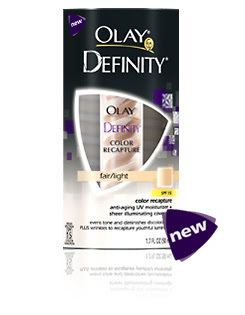 However, a few weeks ago I was reading about a new product by Oil of Olay. I've used Oil of Olay (thanks to my mother's force) since I was 10 years old and I'm always up for trying new products-- especially now that I'm getting older and need to keep the wrinkles at bay. Anyways, the new stuff is called Olay Definity Color Recapture Anti-Aging UV Moisturizer + Sheer Illuminating Coverage and it's quite fabulous. It's not nearly as thick as a foundation, but it covers much better than a tinted face lotion. Additionally, it's full of moisturizers and an anti-aging serum. Basically, it's an easy way to kill three birds with one stone (moisturizing, color and anti-aging). Since I started using it, several people have commented that I look like I just came back from the spa and asked where I get my facials done. I don't.. but I think I'm going to have to buy stock in this product.